Particle size reduction through milling is used to improve powder properties so that the material has improved flowability, reactivity, bulk density and compactability. For example, in the pharmaceutical industry, milling is used to achieve particle sizes that improve the dissolution of a tablet and enhance absorption rates. Selecting the right milling process ultimately depends on your finished product’s required size range and your raw material’s size and friability. Hammer Mills use mechanical 'in-air' impact forces to transform bulky raw materials into uniform particles. 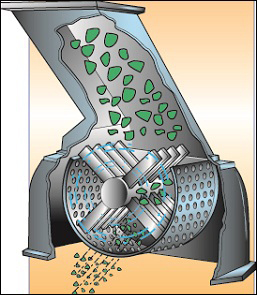 The key variables controlling particle size are rotor speed, screen size & geometry and feed throat. Fitzpatrick Hammer Mills produce the smaller PSDs and are more suited to abrasive and difficult to mill products. They are the mill of choice when you need to precisely control the particle size reduction process. It is important to get the feed throat angle matching the material characteristics - a vertical inlet for fragile material or horizontal for fine grinds. 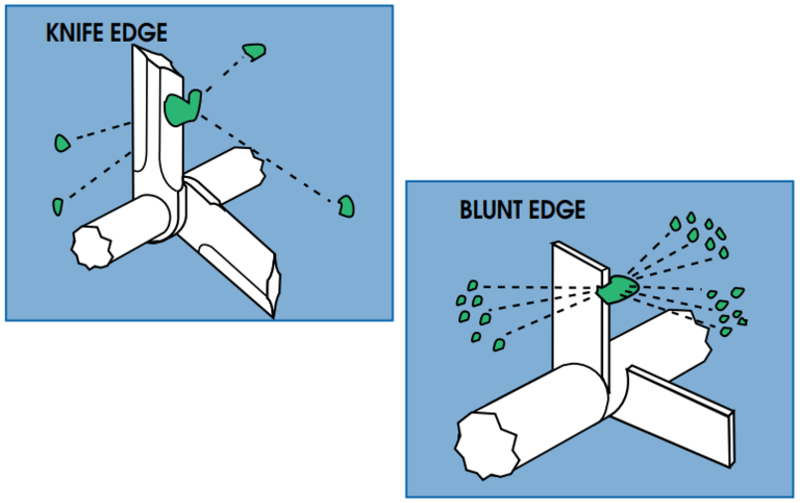 Blades can be knife-edged for gentle granulation or blunt-edged for more impact and aggressive particle size reduction. A blade with reversible edges becomes truly versatile, being able to match any product requirement. 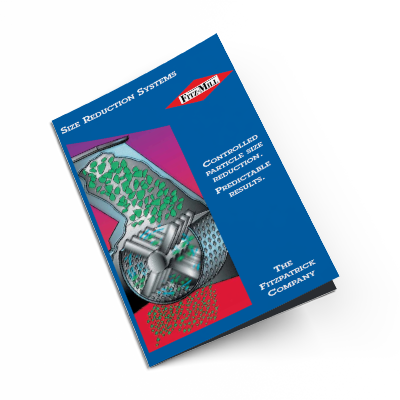 Find out how the Fitzpatrick Hammer Mill could be the solution to your particle size reduction needs by requesting our brochure today. By altering the rotor speed and screen design it is possible to get a variety of results from just a single mill, enabling you to adjust to your particular product needs. For every combination of rotor speed and screen, particles in a certain size range are permitted to pass through the screen and exit the machine. Higher rotor speeds flatten the approach angle of a particle relative to a screen’s surface, effectively reducing the screen’s hole size. A circular hole will appear elliptical, thereby allowing only smaller particles to pass through. 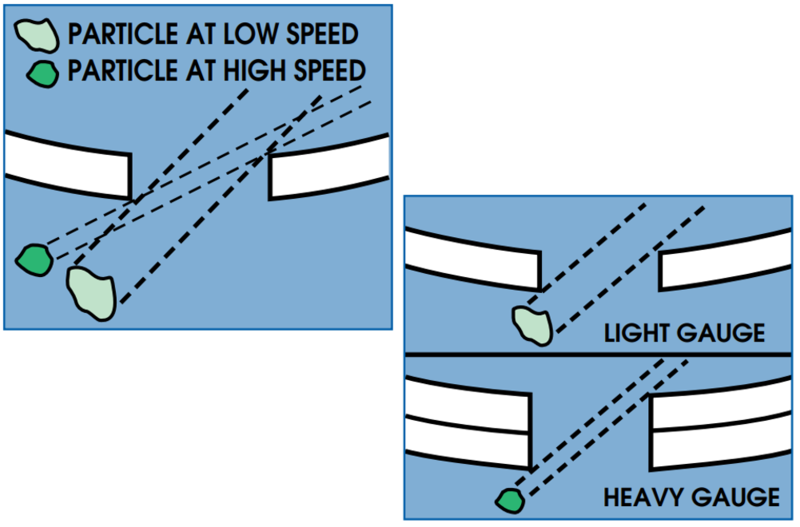 At slower speeds, the approach angle increases, allowing larger particles to pass through. As screen gauge increases, from light to heavy, the hole opening size must also increase to maintain the desired particle sizes that are being released.